Join our Facebook group Selective Mutism Awareness and LIKE our Page! Thank you! Connect with us on these social media sites! by clicking the icon below! How often do you get the chance to change the world, without even leaving your seat?! The biggest step in overcoming SM is: realizing that you have it. The problem with that is: No one has ever heard of it! change the world, one word at a time. 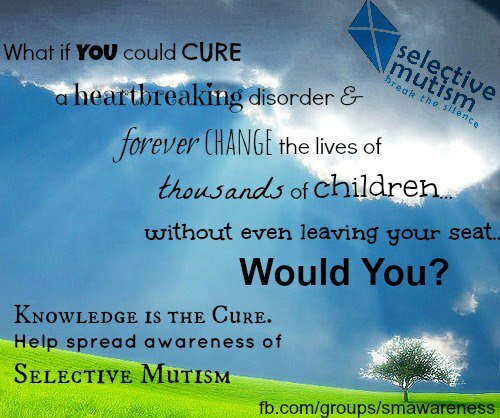 THERE IS A CURE FOR SELECTIVE MUTISM-IT IS KNOWLEDGE! SHARE YOUR KNOWLEDGE!